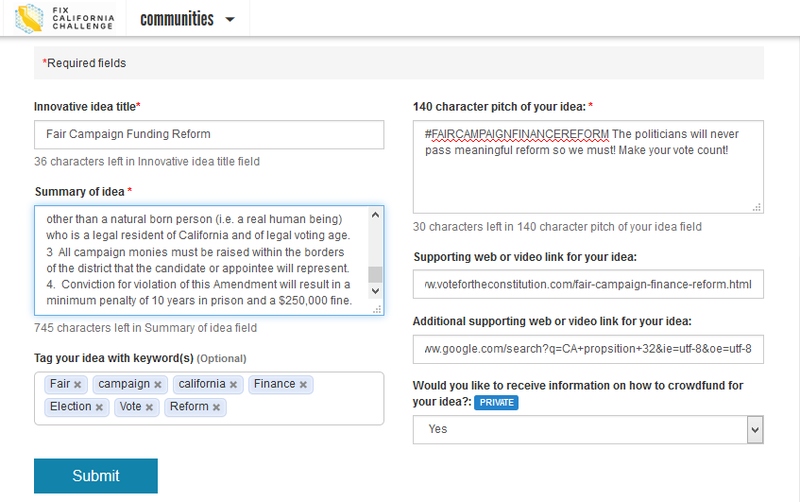 This is my "Fair Campaign Finance Reform" initiative. I've had the idea for this initiative since about 2010. I believe that current campaign financing should only be allowed to come from the "People" (natural persons (i.e. a real human beings) who are legal residents of California and of legal voting age) and that corporations or other "non-natural persons/human beings" should be prohibited. Every candidate needs our vote to be elected but after election they become owned by corporations and lobbyists to do their bidding. The poor voter cannot compete with the billions of dollars that corporations and lobbyists can afford to spread around. And our representatives will never pass any kind of meaningful campaign reform. 1. Only a natural person (i.e. a real human being) who is a legal resident of California and of legal voting age shall be eligible to contribute a total sum of $2,500 to a candidate's political campaign for purpose of election or appointment to a government office. 2. Every candidate running for elected or appointed to office is prohibited from receiving more than a total sum of $2,500 per political election or appointment campaign from anyone other than a natural born person (i.e. a real human being) who is a legal resident of California and of legal voting age. 3 All campaign monies must be raised within the borders of the district that the candidate or appointee will represent. 4. Conviction for violation of this Amendment will result in a minimum penalty of 10 years in prison and a $250,000 fine.